OfficeUS Team in front of U.S. Pavilion. Photo by David Sundberg. ESTO. 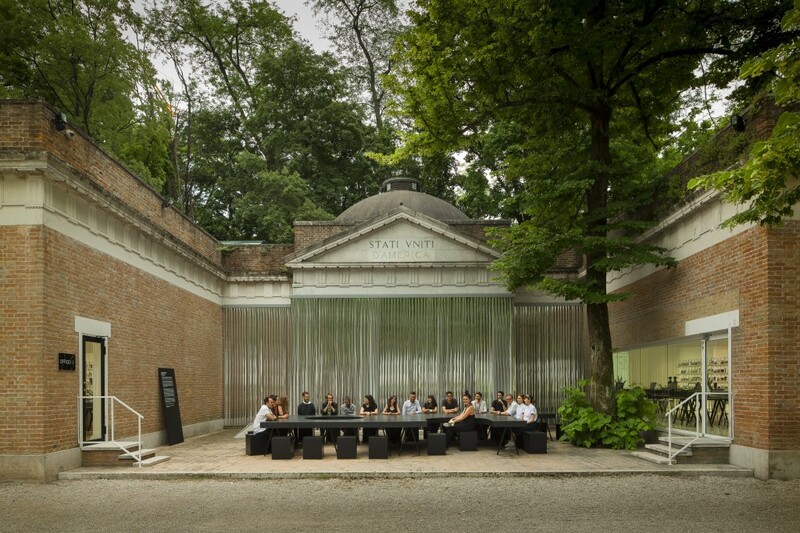 Storefront for Art and Architecture, the commissioner of the 2014 United States Pavilion at the 14th International Architecture Exhibition – la Biennale di Venezia presented OfficeUS, a global experiment in the making of architecture, history and work. OfficeUS responded to the theme of Absorbing Modernity:1914-2014 by focusing on the ways in which the space, structures, and protocols of the U.S. architectural office have participated in the construction of Modernity. OfficeUS, simultaneously a repository and a laboratory of ideas and criticism in the form of an alternative architecture office, looked simultaneously backward and forward, submitting both historical material and office protocols to contemporary agents of disruption, critique, pessimism, and optimism physically and digitally. 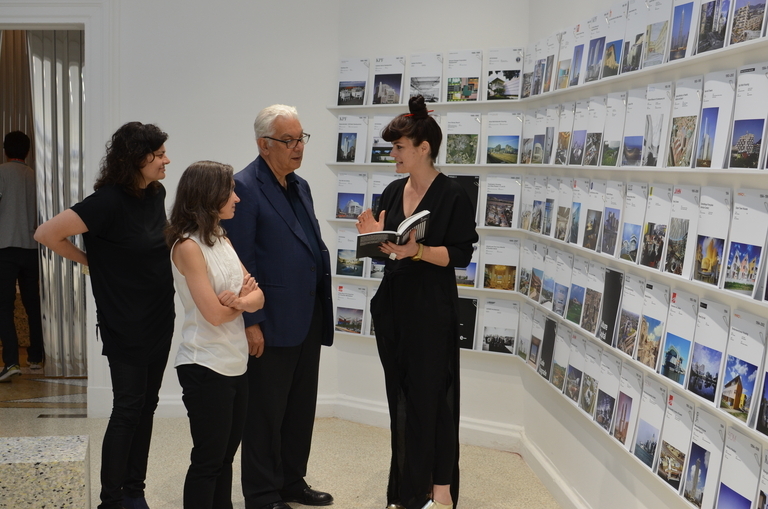 Occupying the US Pavilion at the 14th International Architecture Biennale in Venice from June 7 through November 23, 2014, OfficeUS presented a global history of the architectural office while mapping aspirations for its future. 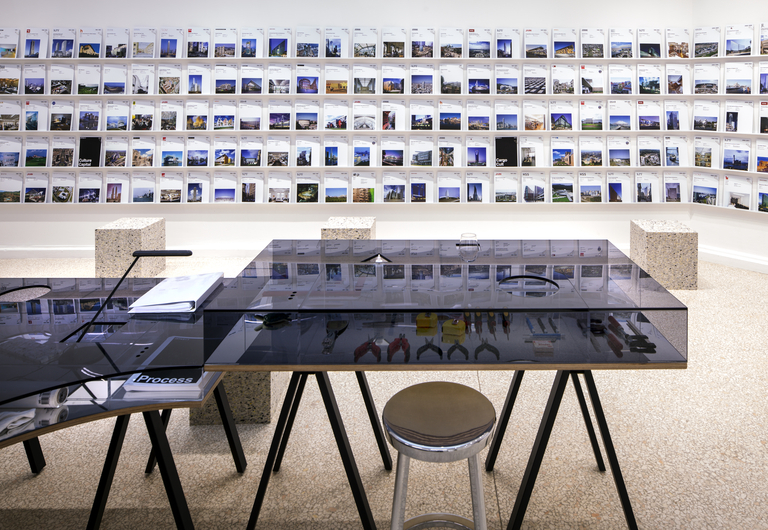 The exhibition containing an archive of nearly one thousand projects produced by US offices abroad between 1914 and 2014 -the OfficeUS Repository- located the intersection of the operations of US architectural firms, their international impact, and the implications of their production in the last century. An onsite office of 8 architects selected from an international open call, worked with the OfficeUS Repository over the twenty five weeks of the biennale in collaboration with global outpost offices and a series of visiting experts with the mission to look backward and forward simultaneously, submitting historical material to contemporary critique while projecting alternative futures, serving simultaneously as an archaeology of global architectural firms and a critical challenge to them. The OfficeUS Repository, chronologically organized, consisted of binders of architectural documentation and contemporaneous media presence. Interspersed throughout these histories, a series of twenty five Issues— each with its own binder—emanated from this work, provoking debate, outlining aspirations for the office and guiding the weekly investigations throughout the biennale. The exhibition, conceived as a historical, operational and experiential mirror of past and contemporary concerns, provided a thorough spectrum of archive material, a platform for projection and critic and a challenge to each visitor’s preconceived interest in a body of work that for the first time was put under the scrutiny of the architecture community. While the exhibition explicitly and purposely denied easy classifications through political or social clichés, formal discourses or facile oppositions between self proclaimed critical or corporate practices, it opened –sometimes violently- new conversations about each one of these issues, disallowing the simple consumption of prepackaged history often expected of such exhibitions. The projects compiled and displayed in the OfficeUS Repository, always buildings with a public agency, were often understood by their architects, clients or inhabitants to be singular interventions. On the whole, however, the activities of US architecture firms abroad have more often than not been analogous to the country’s fraught political and economic international involvements, historically in sync with more and less benign forms of imperialism. In order to fully understand how these forms, drivers and agents are still at play today in a global economic and political context -and perhaps influence its future course-, OfficeUS provided a first transversal cut of this body of work based on built evidences around the globe bringing into the space of historical debate and architectural design, a purposely vast collection of buildings and offices, specially the historically dismissed and disregarded but omnipresent in the structures of political, economic and social power. 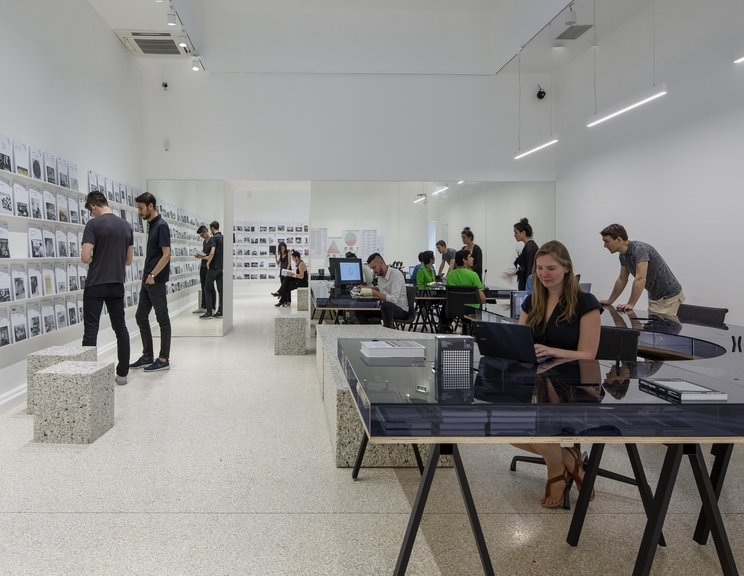 Opening –fully- the conversation of architecture on ideological grounds, OfficeUS provided a space for the reexamination of existing structures of architecture production while investigating the contemporary foundations for architectural design, from ethical to aesthetic aspirations. OfficeUS opened as an experimental global architecture office. While recasting a number of elements that have together constituted the architectural office—from the drafting desk to the meeting table, from the organizational chart to the material and project libraries—OfficeUS also rewired relationships between partners, clients, consultants, and critics. The OfficeUS Repository, which served as the library for visitors and the live office, was presented neither as a definitive body of research nor as the final word on this history. With ideas functioning as clients, and all of their interlocutors as potential double agents, the OfficeUS partners embodied and examined the contemporary implications of global work and the complex and problematic history presented in the archive constructing a new space for architectural inquiry and production. Transforming extensively throughout the course of the biennale, the office engaged with multiple forms and mediums where work, play and display merged as pedagogical, exhibition or professional demands and concerns inhabited the ideological debates and lines of inquiry developed by the partners in conjunction with active visitors and experts. The six months of OfficeUS reflected, in a present tense, on the multiple demands and challenges that architecture practice is and should address today as a matter of public and global concern while simultaneously understand and highlight the importance of systemic historical legacies and the need for the construction of new evidentiary grounds. OfficeUS: Design by Leong Leong produced a design concept, developed in collaboration with curators Eva Franch, Ana Miljacki and Ashley Schafer, that goes beyond the typical exhibition experience to create a living architecture office that redesigns projects from the archive over the course of the Biennale. In doing so, the installation challenged conventions of contemporary workspaces and the role of history in architectural design. The installation design consisted of three primary elements: The Archive, The Table, and The Conference Room. The interior walls of the pavilion were wrapped in a continuous archive of 1,000 projects through a light shelving system. 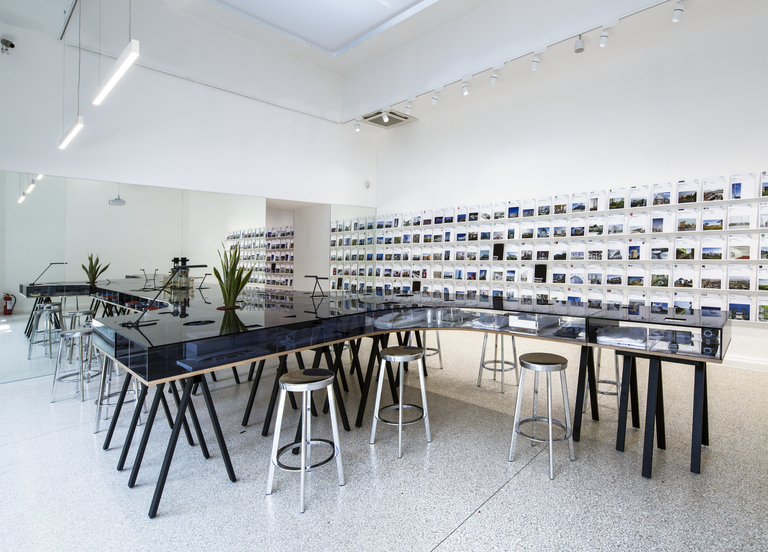 The OfficeUS table, a hybrid of a living archive and a modular work surface that spanned through all the galleries of the pavilion, altered the symmetry of the Neo-Palladian floor plan. The monolithic table, reconfigurable, allowed the workspace to be reorganized to accommodate new forms of collaboration and interaction. Over the course of the exhibition, artifacts from the office design process (models, sketches, drawings, etc.) were displayed in the translucent table alongside tools of the contemporary architecture office. The work surface extended from the interior galleries into the courtyard of the pavilion, acting as both a public conference table and a platform for discussions, workshops, and events. OfficeUS: Corporate Avant Garde graphic identity by Natasha Jen/ Pentagram constructed a visual interplay between the historical understandings of the corporate and the institutionalized, and the avant-garde forms of communication. 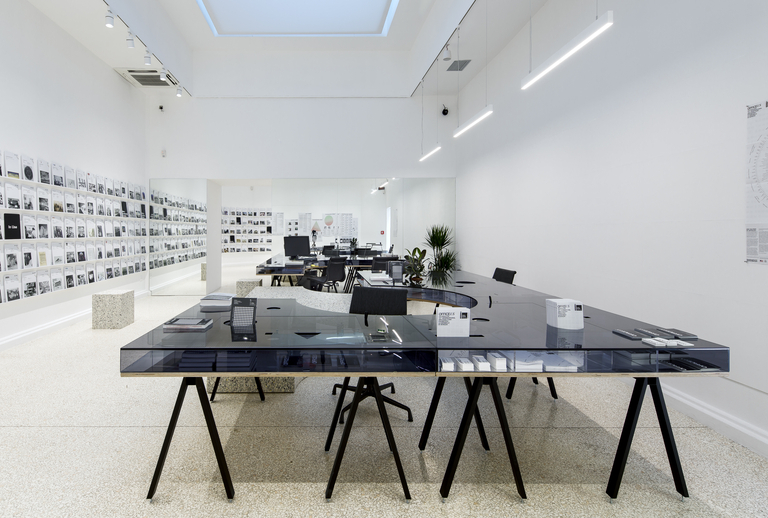 Present in every design aspect of the project, the OfficeUS identity constructed in its basis by Arial and Times New Roman italic types, moved through the space of the office, the publications and the digital and physical curatorial objects and platforms. OfficeUS: Office Scents by Christophe Laudamiel constructed olfactory spaces for the five rooms in the OfficeUS in Venice as a sensorial historiography and critique of the projects and offices contained in the Repository and as a spatial materialization of the functions contained in each room. OfficeUS Fundamental views by Brett Beyer is a photographic journey through twenty architecture offices in New york portraying seven fundamental views of the architecture office. OfficeUS Dress Code by Slow and Steady Wins the Race, produced through a series of reenactments of classical pieces of clothing, presents a collection of shirts for the OfficeUS Partners that brings slight lines and threads of humour into the white shirt of the corporate office. OfficeUS Tote by American Apparel was produced as a super functional container with four of the 25 OfficeUS Issues. These included: Crude Ideals, The Invisibles, Anger and Love Management, and Trojan Horses. OfficeUS: The Architects a film by Amie Siegel cuts transversally through the city of New York, moving through ten architecture studios—from Fifth Avenue to downtown to Brooklyn- unveiling the operational territories and landscapes of global architecture production. A singular visual unfolding, the film deploys silent conversations among the architectures, locations, objects and characters that inhabit the picture frame, raising questions of scale, agency and power. 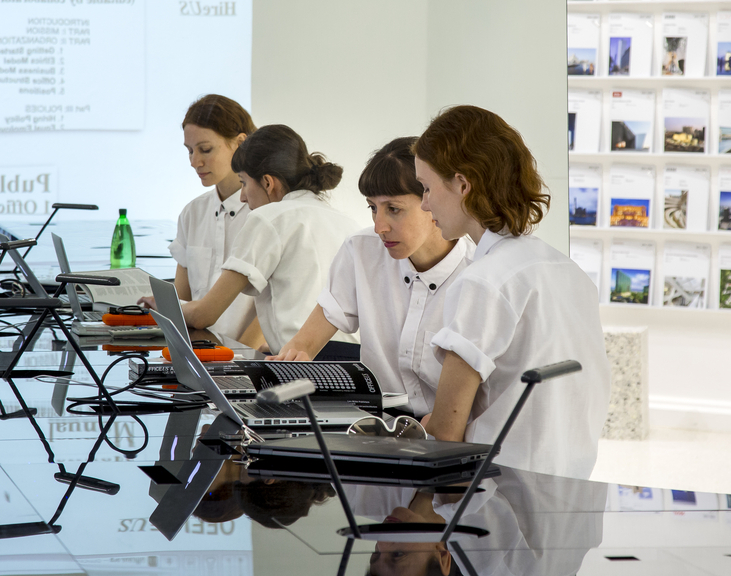 And finally, the OfficeUS Books, by the curatorial team together with a vast network of researchers and contributors produced four books published by Lars Muller compiled the research and work produced for the launch of the project and during its presentation in Venice from June to November 2014. The OfficeUS Agenda (Lars Muller 2014), weaves together the last hundred years of architecture production through themes and concepts of Modernization, US architectural firms, and their exports through a collection of essays and visual narratives. With thirteen essays that include a wide range of viewpoints on the subject by notable scholars such as Barry Bergdoll, Beatriz Colomina, Jorge Otero-Pailos and Keller Easterling the book is illustrated in part with archival photographs by Esto. The visual narratives serve as foils to the essays. Contributors include: Daniel Barber, Barry Bergdoll, Beatriz Colomina, Peggy Deamer, Keller Easterling, Brendan Hookway, Timothy Hyde, Michael Kubo, Ijlal Muzaffar, Jorge Otero-Pailos, Ivan Rupnik, Hilary Sample, Claire Zimmerman. OfficeUS Atlas (Lars Muller 2015), the second in the series of OfficeUS books, is a collection of key press records of US production abroad and the transformations of the US architectural office over the last one hundred years. In highlighting some of the major historical narratives threaded through the century, the book uses the timeline of offices and projects established by the exhibition as its backbone. OfficeUS Atlas functions as a map, as a seed of future research, and as an instigator of further discussions regarding our architectural past and future; a ground where we hope some may put their foot and step in a conversation that we believe has just started. The third book OfficeUS Manual (Lars Muller 2016) is a guide to day-to-day architectural practice that documents and interrogates the protocols and procedures of architecture offices over the last hundred years. Thoroughly insightful, often humorous, and sometimes stupefying, the Manual combines historical material from large firms and small studios with contemporary reflections by more than 50 architects, artists, and writers concerned with the needs and desires of professional architecture practice today. 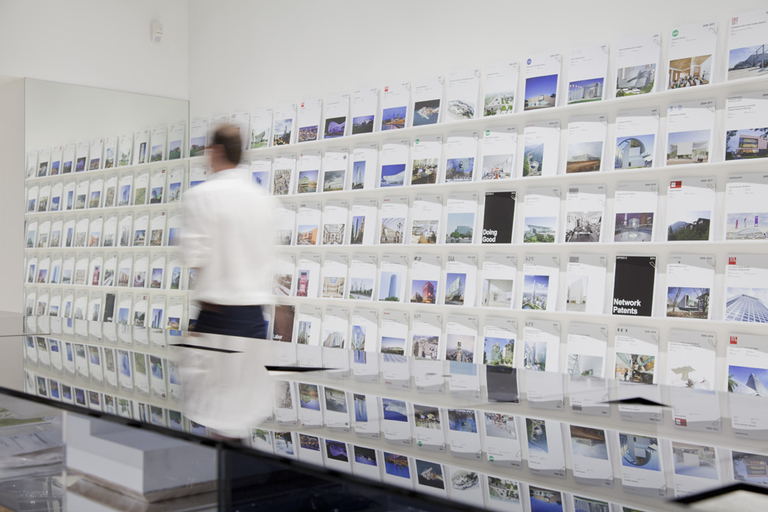 The Manual is a seminal publication that sheds light upon the culture and design of an architecture office, with all its nuances, paradoxes, and visions for both inherited and imagined futures. The final book, OfficeUS New World (Lars Muller 2016) is a compilation of the conversations and projects developed by OfficeUS in Venice from June to November during the course the XIV Venice Architecture Biennale. 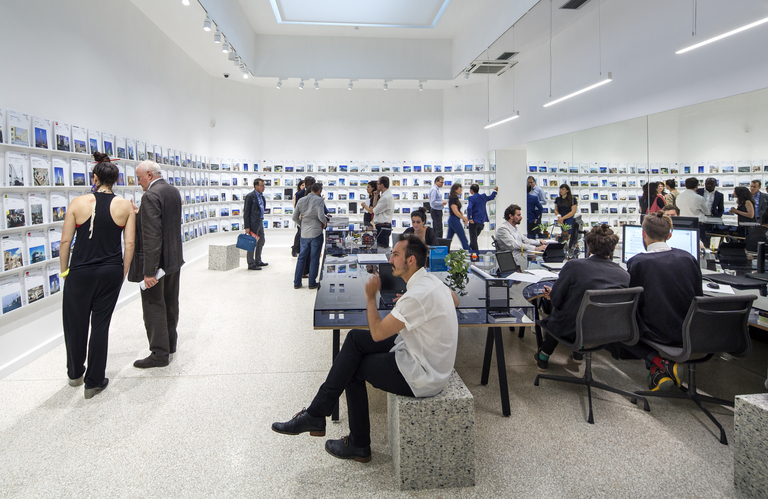 All content and work produced throughout the biennale was recorded, broadcasted and transmitted through the online platform of OfficeUS. You can learn more about OfficeUS on the OfficeUS Blog here. OfficeUS PartnersArielle Assouline-Lichten, Curtis Roth, Cooking Sections: Daniel Fernández Pascual & Alon Schwabe, Manuel Shvartzberg Carrió, Matteo Ghidoni, and M-A-U-S-E-R: Mona Mahall & Asli Serbest. ParticipantsL. Aydelott and Associates, Acconci Studio, Adrian Smith + Gordon Gill Architecture, Adrian Wilson Associates, AECOM, Albert Kahn Associates, Antoine Predock Architect PC, Arquitectonica, Arthur B. Froehlich and Associates, Asymptote Architecture, ATOPIA, Ayres, York and Sawyer, Bassetti Architects, Benjamin Thompson Associates, Bernard Tschumi Architects, Bohlin Cywinski Jackson, Brown Daltas and Associates, Cambridge Seven Associates, Cannon Design, Carl Koch, Carlos Zapata Studio, Cass Gilbert, Center for Environmental Structure, CRSS Inc., Daniel, Mann, Johnson & Mendenhall, Davis Brody Bond, Delano and Aldrich, Diller Scofidio + Renfro, Donald Hatch and Associates, Duany Plater-Zyberk & Company, Eduardo Catalano, Edward Durell Stone and Associates, Edward Larrabee Barnes Associates, Eero Saarinen and Associates, Eisenman Architects, Ellerbe Becket, Epstein, Frank Lloyd Wright, FXFOWLE Architects, Gehry Partners, Gensler, George A. Fuller Company, Gluckman Mayner Architects, Goettsch Partners, Graham, Anderson, Probst & White, Gunnar Birkerts and Associates, Gwathmey Siegel Kaufman Architects, Harrison and Abramovitz, Harry Weese Associates, Hartman-Cox Architects, Hashim Sarkis Studios, Helmle and Corbett, Henry Killam Murphy, HKS, Inc., Hodgetts + Fung, HOK, Holabird and Root, Höweler + Yoon Architecture, Hugh Stubbins and Associates, I. M. Pei Architect, Integrus, JAHN, Jerde Partnership, John Hejduk, John Johansen, John Portman and Associates, John Russell Pope, Joseph Allen Stein and Associates, Kevin Roche John Dinkeloo and Associates, Kieran Timberlake, KMW Architecture, Koetter Kim and Associates, Kohn Pedersen Fox Associates, KVA matx, L.E.FT, Lathrop Douglass, LEESER Architecture, Leo A Daly, Leong Leong, LOT-EK, Louis I. Kahn, Louise Braverman, Architect, Machado and Silvetti Associates, MACK Architect(s), Marcel Breuer Associates, MASS Design Group, McKim, Mead & White, Michael Graves and Associates, Michael Maltzan Architecture, Mitchell/Giurgola Architects, Moore Ruble Yudell, Morphosis Architects, Morris Lapidus Associates, MOS Architects, NADAAA, NBBJ, NELSON H2L2, OBRA Architects, Office dA, ORG Organization For Permanent Modernity, over,under, Paul Rudolph, Paul Williams, Payette, Pei Cobb Freed & Partners Architects, Pelli Clarke Pelli Architects, Perkins + Will, Perkins, Fellows and Hamilton, Perry Dean Rogers | Partners Architects, Philip Johnson / Alan Ritchie Architects, Polshek Partnership, Populous, Preston Scott Cohen, Rafael Viñoly Architects, Ralph Lerner Architects, Ralph Rapson, Raymond & Rado, REX Architecture, Richard J. Neutra, Richard Meier and Partners Architects, Robert A.M. Stern Architects, Robert P. Madison International, ROMA Design Group, RoTo Architecture, RTKL, RUR Architecture PC, Safdie Architects, Santos Prescott and Associates, Sasaki Associates, Schultze and Weaver, Selldorf Architects, Sert, Jackson and Associates, Shepley Bulfinch, SHoP, Shreve, Lamb and Harmon, SITE, Skidmore, Owings & Merrill, Slade Architecture, SmithGroupJJR, SO-IL, Sorg Architects, SsD, Stan Allen Architect, Steven Holl Architects, Studio Daniel Libeskind, Studio Hillier, Studio Shanghai, studio SUMO, STUDIOS Architecture, The Architects Collaborative, The Austin Company, The Eggers Group, The Leonard Parker Associates, The Office of Ludwig Mies van der Rohe, Thomas W. Lamb, Tigerman McCurry Architects, Tod Williams Billie Tsien Architects, Toshiko Mori Architect, Town Planning Associates, USIA-Masey, Utile, Venturi, Scott Brown and Associates, Victor A. Lundy, Victor Gruen International, Vincent G. Kling, VJAA, Walker and Gillette, Walter Burley Griffin and Marion Mahony, Warren and Wetmore, WEISS/MANFREDI Architecture/Landscape/Urbanism, William B. Tabler Architects, William E. Parsons, William L. Pereira and Associates, William Welles Bosworth, Wimberly Allison Tong & Goo, Wodiczko + Bonder, WORKac, Yamasaki and Associates, Zago Architecture, Zimmer Gunsul Frasca.